Bi-Fold or operable screen doors can be added to the front of a gas fireplace to offer a more realistic masonry appearance. 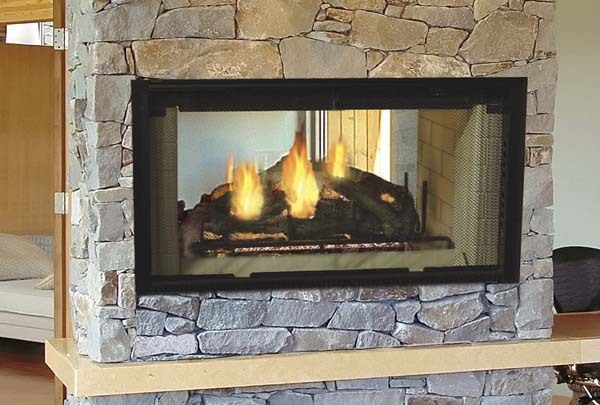 Majestic provides only the very best fireplaces and stoves for your family's enjoyment, and a company leading the way in quality and design should also provide a full line of high-quality replacement parts and supplementary parts. The Majestic SL 1106 6 inch Chimney Section - 11 Inch Diameter is part of Majestic's line of parts, and this 6-inch vent pipe length will get the job done. The 11-inch diameter is compatible with large ventilation piping, and the 3 lb. weight is built to be durable and reliable. A solid chimney is a fitting end to an exceptional stove or fireplace, so choose Majestic today. Majestic provides only the very best fireplaces and stoves for your family's enjoyment, and a company leading the way in quality and design should also provide a full line of high-quality replacement parts and supplementary parts. The Majestic SL 1112 12 inch Chimney Section - 11 Inch Diameter is part of Majestic's line of parts, and this 12-inch vent pipe length will get the job done. The 11-inch diameter is compatible with large ventilation piping, and the 5 lb. weight is built to be durable and reliable. A solid chimney is a fitting end to an exceptional stove or fireplace, so choose Majestic today. Majestic provides only the very best fireplaces and stoves for your family's enjoyment, and a company leading the way in quality and design should also provide a full line of high-quality replacement parts and supplementary parts. The Majestic SL 1118 18 inch Chimney Section - 11 Inch Diameter is part of Majestic's line of parts, and this 18-inch vent pipe length will get the job done. The 11-inch diameter is compatible with large ventilation piping, and the 7 lb. weight is built to be durable and reliable. A solid chimney is a fitting end to an exceptional stove or fireplace, so choose Majestic today. Majestic provides only the very best fireplaces and stoves for your family's enjoyment, and a company leading the way in quality and design should also provide a full line of high-quality replacement parts and supplementary parts. The Majestic SL 1136 36 inch Chimney Section - 11 Inch Diameter is part of Majestic's line of parts, and this 36-inch vent pipe length will get the job done. The 11-inch diameter is compatible with large ventilation piping, and the 13 lb. weight is built to be durable and reliable. A solid chimney is a fitting end to an exceptional stove or fireplace, so choose Majestic today. Majestic provides only the very best fireplaces and stoves for your family's enjoyment, and a company leading the way in quality and design should also provide a full line of high-quality replacement parts and supplementary parts. The Majestic SL 1148 48 inch Chimney Section - 11 Inch Diameter is part of Majestic's line of parts, and this 48-inch vent pipe length will get the job done. The 11-inch diameter is compatible with large ventilation piping, and the 18 lb. weight is built to be durable and reliable. A solid chimney is a fitting end to an exceptional stove or fireplace, so choose Majestic today. A chimney stabilizer is an easy way to ensure a long life for your chimney. Many people decide that a chimney stabilizer is irrelevant but only until their chimney begins to sag or lean with age and wear. When the high winds and severe weather come along, your chimney takes the brunt of the storm, so stabilize it with the Majestic SL11 6 Inch Chimney Stabilizer - 11 Inch Diameter today. It isn't too bulky or visually invasive, so you don't have to worry about it dominating the look of your roof or chimney. Its 5 lb. composition is sturdy, and this 6-inch vent pipe support is built to last. Majestic ventilation piping is just as reliable as one of their stoves or fireplaces, but what else would you expect from a leader in the fireplace and stove business? The Majestic SL1130 30 Degree Offset and Return Elbow - 11 Inch Diameter provides a wider option for those looking for ventilation elbow piping. The 30-degree angle helps you efficiently use ventilation piping in hard-to-reach, angular sections of length, and the Offset and Return Elbow are both included in this kit. The unit weighs 10 lbs. and is intended to last for years. Use the Majestic vent pipe elbow for efficient ventilation today. Are you looking for an effective firestop spacer for your Majestic vertical fireplace flue? The importance of firestops is well known--they keep your floors and ceilings safe as your flue rises through multiple levels of your home. The right firestop spacer can be just as crucial for your safety, however, and the Majestic FS 538 Firestop Spacer for Straight Flue - 11 Inch Diameter will work perfectly with your Majestic firestop to keep your home safe. Keep your vent piping stable with the included vent pipe support pieces, and this 26 lb. kit will last for years to come. Majestic firestops are a wonderful accessory for keeping your home safe because they protect the ceiling, walls, and floors that your vent piping must pass through. Using the correct spacer with your firestop is also essential, however, and the Majestic FS 540 30 Degree Firestop Spacer -- 11 Inch Diameter will work with your firestop to provide safe insulation for the heat. This 30-degree spacer is part of a full line of certified spacers for any angle or direction, and the included vent pipe support pieces will keep your vent piping stable. Use the 11-inch firestop spacer with Majestic fireplaces/stoves and firestops. If you own a Majestic stove or fireplace, you already know the comfort and warmth it can provide. You also know, however, that there is a lot going on behind the scenes to keep your fireplace system functioning to it highest potential, and the Majestic RH 570 Roof Flashing, 0-61/2 pitch - 11 Inch Diameter will help your ventilation working more efficiently. The 0-61/2 Pitch is an added feature that washes water right off the flashing and prevents snow from accumulating as much as it would otherwise. This flashing is compatible with an 11-inch ventilation pipe termination, and the sturdy 10 lb. design will stand the test of time. If you own a Majestic stove or fireplace, you already know the comfort and warmth it can provide. You also know, however, that there is a lot going on behind the scenes to keep your fireplace system functioning to it highest potential, and the Majestic RH 570 Roof Flashing, 6/12-12/12 pitch - 11 Inch Diameter will help your ventilation working more efficiently. The 6/12-12/12 Pitch is an added feature that washes water right off the flashing and prevents snow from accumulating as much as it would otherwise. This flashing is compatible with an 11-inch ventilation pipe termination, and the sturdy 12 lb. design will stand the test of time. Are you looking to install a chimney in your own home, or perhaps construction and home improvement is in your line of work? Look for Majestic products for clear installation instructions and long-lasting performance. The Majestic AS10 Attic Insulation Shield with Straight Flue is a high quality product that is a necessary piece when building a chimney through an attic. If there's a possibility that the insulation in the attic may come too close to the chimney, then an insulation shield is a must. It weighs 6 pounds and measures 11 inches in diameter. It also comes with a straight flue; the firestop is not included. Do you live in an area that frequently gets rain storms or snow? You probably want to invest in a storm collar to waterproof the connection between your room and your fireplace chimney. This extra measure of protection will help ensure that water stays outside where it belongs and doesn't make its way through the small crack and into your attic and home. Majestic makes several quality products that protect your home from water damage. This Majestic TR11 Round Termination Cap with Storm Collar is just one of those amazing options! The TR11 model contains both the termination cap as well as the storm collar-all in one package. Do you live in an area that frequently gets rain storms or snow? You probably want to invest in a storm collar to waterproof the connection between your room and your fireplace chimney. This extra measure of protection will help ensure that water stays outside where it belongs and doesn't make its way through the small crack and into your attic and home. Majestic makes several quality products that protect your home from water damage. This Majestic TR11T Round Termination Cap with Storm Collar is just one of those amazing options! The TR11T model contains both the termination cap as well as the storm collar-all in one package. DSR42 uses SL1100 series chimney in U.S. and SL400 series chimney with SLA10 and CAK5A in Canada. *Venting Requirements: This unit requires venting pipe with an inner diameter of 11 Inches. Please see the Venting Components section on this page for venting pipe that must be used with this unit. WARNING: This product and the fuels used to operate this product (wood and wood pellets), and the products of combustion of such fuels, can expose you to chemicals including carbon black, which is known to the State of California to cause cancer, and carbon monoxide, which is known to the State of California to cause birth defects or other reproductive harm. For more information go to www.P65Warnings.ca.gov. This 42 inch designer model of a wood burning fireplace brings the traditional wood fire style to a different level. This time, it comes with a very elegant design which also allows you to have a good view of the fireplace, along with its exciting design applications. It comes with a standard radiant design, as well as a refractory brick interiors. It is also equipped with a See Thru Designer style which offers a double viewing pleasure. It does not have smoke baffles, and comes with a good clean look, stylish fireplace which offers an unobstructed overall view of the fire. Is there a fan blower on each side and does a programable remote come with it ? Unfortunately, this fireplace does not include a blower, nor does it have a remote control option. Can this unit be used outdoors for a patio? Both sides would be outdoors in an exterior chimney. While you can build over the facing of this unit to minimize damage from the outside air (rust/corrosion), this fireplace is not listed for outdoor use and therefore we cannot recommend such an application. Is there an indoor outdoor fireplace that can be wood or gas? Pretty much any listed outdoor wood burning fireplace may be installed with a natural gas or liquid propane log lighter for igniting a load of wood and may also be installed with any listed natural gas or LP gas log set. I am building new home and want to install Majestic 42" see thru wood burning fireplace. Chimney will run straight up. I assume I will need a ceiling fire stop, a steep pitch roof flange, and a vent cap. Also need SL11 pipe determined by distance from top of unit to vent cap. Doers this sound about right? Yes, you have covered the components needed for a straight shot install. I would only suggest an attic insulation shield if you are going through attic space with blown in insulation. You can also box out the area without this part to keep clearances to combustibles maintained. It is important to refer to your manual for pipe needed above the roof to pass your pitched flashing. Can you tell me what the dimensions are on this unit? Detailed dimensions are provided in this installation manual. Is this fueled with just gas or just wood fuel? This is a woodburning fireplace by design, but you can run a gas line into it and add a vented or ventless gas log set, if you prefer. However, the fireplace must still be installed with the appropriate woodburning chimney components, regardless of which option you choose. Does this unit provide heat to both rooms? Both sides of the fireplace are open, as such, radiant heat would be provided to both rooms. What kind of approximate BTU's does the 42" see-through put out? Typical BTU output generated from a large fire in a see through fireplace will be approximately 100,000 to 120,000. Please keep in mind that heat output from an open faced fireplace will be limited, as the design pulls a large amount of dilution air from the room. Can this unit be installed on an exterior wall for indoor/outdoor use? This can not be used for indoor/outdoor use. It is only meant for use indoors. Stunning addition to my new home! It was exactly what I hoped for! A unique showpiece that will keep my home and heart warm for years to come! Somewhat easy to install. Venting is very expensive and the time it took to get the help from efireplacestore was not the greatest.